Review: What Follows After by:Dan Walsh | A Simple Life,really?! In October 1962, Colt Harrison and his little brother, Timmy, hatched a plan. They would run away from their Florida home, head for their aunt’s house in Savannah, Georgia, and refuse to come home until their parents got back together. But things go terribly, terribly wrong. Colt’s mother and father must come to grips with years of neglect and mistrust in order to recover their beloved sons, their love for one another, and their broken marriage. In this emotional story, Dan Walsh takes readers on a journey to rediscover the things that matter most in life–love, truth, and family. Dan Walsh is the bestselling author of several books, including The Unfinished Gift, The Discovery, and The Reunion, as well as The Dance and The Promise with Gary Smalley. He has won three Carol awards, and three of his novels were finalists for RT Book Reviews Inspirational Book of the Year (2011-2013). Dan lives with his wife in the Daytona Beach area, where he’s busy researching and writing his next novel. Visit http://www.danwalshbooks.com for more. 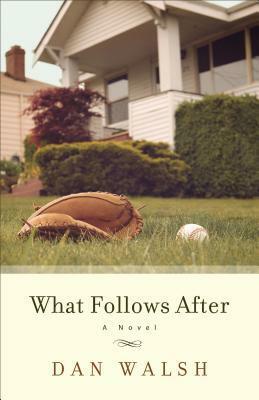 What Follows After, is a story set in the 1960’s about two little boys dead set on getting their family back together. But not long after making that drastic decision for all four of them, things go horribly wrong for Colt and Timmy. Thinking that the path they have chosen will put their parents back on a path of forgiveness&restoration, something happens along the way that will question all of that. In this bittersweet story of love and family, we will learn just as that family did that day what Genesis chapter 50 truly means–what man meant for evil, God meant for good. I really enjoyed this book, the time period it was set in fit it perfectly. Getting towards the end of the book and when the unthinkable is reversed was an answer to pray even for me. Reading this fictional tale seemed very real. I loved this very raw, emotional story!